Diamondbacks pitcher has clubs stolen at Waste Management Phoenix Open in Scottsdale. 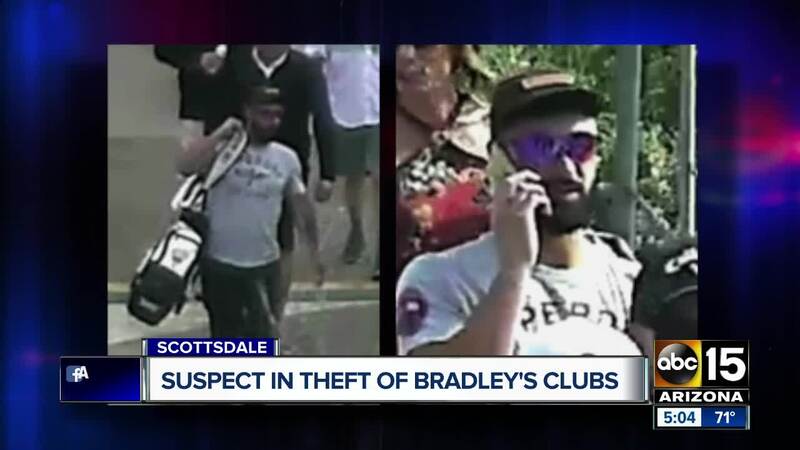 SCOTTSDALE, AZ — Scottsdale police are asking for the public’s help identifying the man who stole Arizona Diamondbacks relief pitcher Archie Bradley’s golf clubs at the Waste Management Phoenix Open. On Wednesday, after competing at the Waste Management Phoenix Open Annexus Pro-Am in Scottsdale, Bradley took to social media to let everyone know his golf bag has gone missing. Bradley said his bag was "definitely stolen" from the 16th hole. Along with his clubs, Bradley said the bag had his wallet, phone chargers, and his dad's sunglasses inside. On Saturday afternoon, police released a photo and description of the man they’re looking for. He is described a white man, 5 feet, 11 inches tall, 180 pounds with a full beard and tattoo on his left forearm. The suspect was last seen wearing a dark hat, gray t-shirt, and dark pants. Last summer, Bradley went through a sleepless night after his dog and best friend Crash went missing. Fortunately, that story had a happy ending -- and Archie certainly hopes this one will, too. If you have information, please contact the Scottsdale Police Department or Silent Witness at 480-Witness.